Receive your Animal Reiki Certification. This class is for minimum Level 2 Reiki Practitioners who want to deepen their relationships with animals and learn practical ways to apply Reiki to heal the animals in their lives. Guidelines of the treatment process including; introduction, signs of acceptance/refusal, hands on/off positions (and when to use them), insights during treatment and ending a treatment. Animals are our greatest teachers. While we may have to learn to connect to universal source energy that is at the core of our Reiki practice, animals intuitively know, understand, and exist in this space already. They are naturals at tuning in and applying Reiki energy to facilitate their own healing. 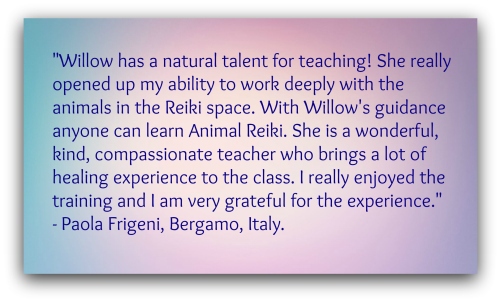 Working with animals in the Reiki space is a unique and rewarding experiences that will not only enhance your knowledge of Reiki, but greatly expands your journey as a Reiki Practitioner. Length: Approximately 4 hours of class time. Plus, two weeks of practical application to be completed on the students own time. At the end of which you will be given the opportunity to discuss your experience with the class and explore any questions you may have with your teacher and fellow students. Going out into the world and practicing your new Animal Reiki knowledge is just as important as the class portion itself. Your Animal Reiki Certification will be given once all the material is covered and exercises completed. *The Animal Reiki Manual will be supplied to you at the beginning of class. Dates are always being added to our class schedule. Please contact Willow for more info.